Tea is considered a National Beverage in Russia. Since 1638, tea has had a rich and varied history in Russia. Due in part to Russia’s cold northern climate, it is today considered the de facto national beverage, one of the most popular beverages in the country, and is closely associated with traditional Russian culture. It was traditionally drunk at afternoon tea, but has since spread as an all day drink, especially at the end of meals served with dessert. An important aspect of the Russian tea culture is the ubiquitous Russian tea brewing device known as a samovar, which has become a symbol of hospitality and comfort. Tea in Russia was introduced in 1638, when a Mongolian ruler donated to Tsar Michael I four poods (65–70 kg) of tea. According to Jeremiah Curtin, it was possibly in 1636 that Vassili Starkov was sent as envoy to the Altyn Khan. As a gift to the Tsar, he was given 250 pounds of tea. Starkov at first refused, seeing no use for a load of dead leaves, but the Khan insisted. Thus was tea introduced to Russia. In 1679, Russia concluded a treaty on regular tea supplies from China via camel caravan in exchange for furs. The Chinese ambassador to Moscow made a gift of several chests of tea to Alexis I. However, the difficult trade route made the cost of tea extremely high, so that the beverage became available only to royalty and the very wealthy of Russia. In 1689, the Treaty of Nerchinsk was signed that formalized Russia’s sovereignty over Siberia, and also marked the creation of the Tea Road that traders used between Russia and China. They speak–but in a cunning way. 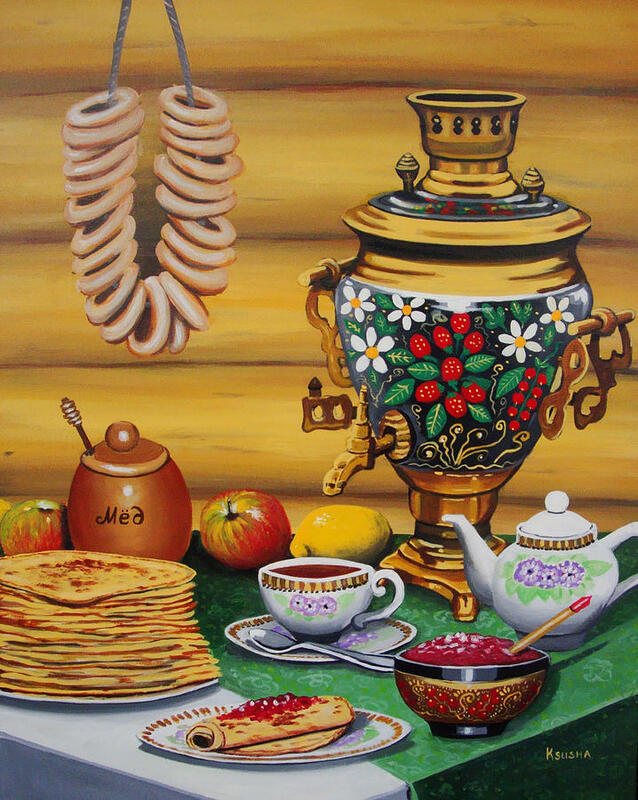 An important aspect of the Russian tea culture is the ubiquitous Russian tea brewing device known as a samovar, which has become a symbol of hospitality, and comfort. Enjoy some of the historical images below, of Russian tea time throughout the ages. Source: Igor Kozlovsky’s facebook page.